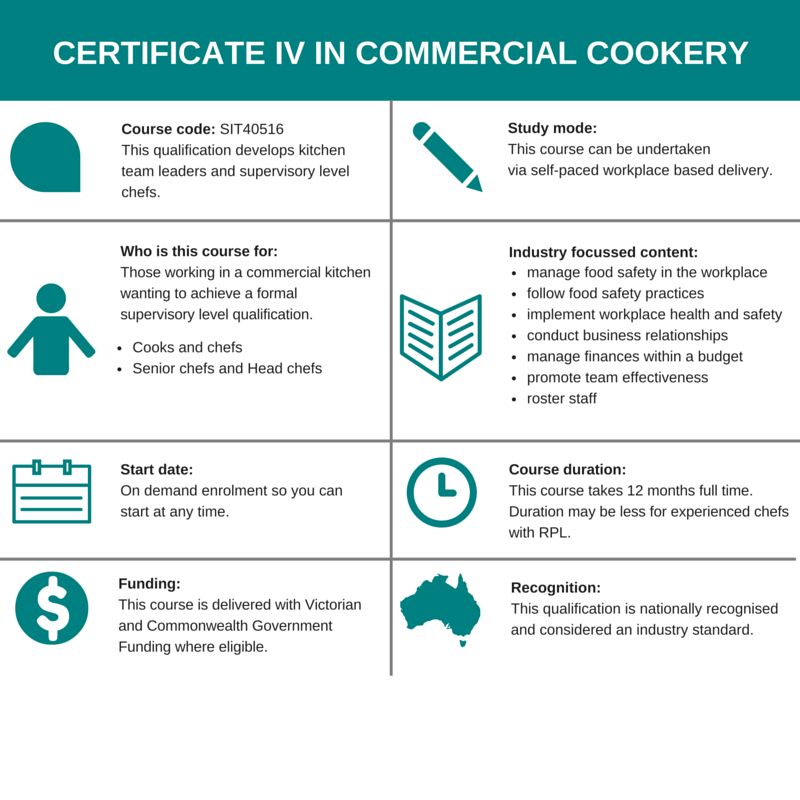 There are no pre-requisites for entry to the Certificate IV Commercial Cookery course. Successful completion of this course provides the skills and knowledge to perform roles including Sous Chef or Team Leader in a restaurant, hotel, pub, cafe or aged care institute. For more great benefits you can expect to gain from training your staff see our Employment Outcomes page here. To enrol in this course you must be at least 15 years old. The course can be delivered on a full-time or part-time basis. It is suitable for a range of employees and individuals. 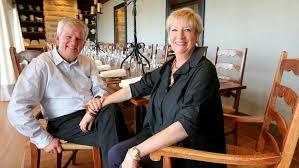 *Prices dependent on students having completed the relevant Certificate III level qualification and units. Our Fees page covers how we set our fees and includes refund information. It adheres to government requirements set annually. All fees are based on qualification program hours and tuition fees may vary depending on units/hours undertaken or changed electives and student tuition fees as published are subject to change given individual circumstances at enrolment. This program is a self-paced competency based program. The duration is 12 months or less with RPL. If an apprentice or trainee the duration of the program may also be the duration of the training contract with your employer unless otherwise agreed. The program is delivered under a workplace training model in your workplace and include at least 4 visits in addition to an enrolment and induction visit over the duration of the program. To ensure a student keeps up with course requirements and completes in the nominated duration they will need to commit on average to around 7 hours per week to complete course requirements and attend any scheduled visits with your trainer for the purpose of training and/or assessment activities. You will be required to undertake tasks at work as specified in your course work and training plan. Under the workplace training model a workplace is required to provide a (full-time) Trainee or Apprentice 3 hours per week withdrawn from normal or routine duties for the purpose of this training. This is included in the 7 hours per week required and not in addition. Note: Weekly commitment will vary depending on the unit of competency being undertaken. RPL, or recognition or prior learning, is available to all applicants. You will need to provide a portfolio of supporting evidence upon enrolment. We honor credit transfers from all current nationally recognised training. You will need to provide statements of attainment from your previous study. To find out more about how to provide information for credit transfers or RPL see here. Opportunities for further training include the Diploma and Advanced Diploma of Hospitality Management.